The long awaited UFC Featherweight title bout between Jose Aldo and Conor McGregor is about to go down in the main event of UFC 194 in Las Vegas, in the early hours of Sunday morning? This article contains our betting preview on Aldo v McGregor fight with tips, best odds, free bets and no deposit bonuses! The two fighters were originally supposed to meet at UFC 189 on July 11, but Aldo had to pull out due to a rib injury. McGregor fought for and won the UFC Interim Championship against Chad Mendes. The Irishman was a clear favorite, and won the fight with a second-round TKO. He landed 74 total strikes, including 15 hard blows to the body of Mendes, before landing the brutal knockout punch. Jose Aldo returns to the octagon after more than a year away and is unbeaten in more than 10 years, winning 18 in a row. His only career loss came in November 2005. Aldo is the best pound-for-pound fighter on the planet and has beaten fighters such as Urijah Faber, Mike Brown, Kenny Florian and Frankie Edgar in his unbeaten run. The Brazilian also knocked top contender Chad Mendes (twice) down in his latest title defense in October 2014. Aldo is one of the most accurate punchers in the UFC and his combinations are seamless. The champion is a specialist of Muay Thai with deadly Brazilian Jiu Jitsu skills. But Aldo is probably best known for his absolutely devastating leg kicks and a knee that has seen him finish several opponents including his first victory over Mendes. Furthermore, he landed over 70 percent of his own takedowns and defended 91.3 percent of takedown attempts against him during his UFC career. The concern for Aldo is that his stamina has been in question over the years. "The Notorious" McGregor (18-2) has won all six of his UFC fights, five by knockout or TKO. All but two of his eighteen career wins have come by way of knockout. His resume features wins over Dustin Poirer, Dennis Siver, Max Holloway, and Diego Brandao. Many fans consider him to be more of a brawler than a technical striker but that could not be farther from the truth. He’s got powerful punching skills and uses his hands like a boxer coupled with muay Thai abilities. An unorthodox fighter with a wide array of skills, McGregor is particularly effective with his feet as a striker. The Irishman has excellent boxing skill and an unpredictable kicking game that could use to keep Aldo in his ideal striking distance. He is an extremely aggressive and well-timed volume puncher that regularly manages to throw 50 hits every round. The concern is that he usually does not respect the striking of his opponents, which results in him dropping his hands and eating otherwise easily avoidable punches. Plus, we can't forget that he was dominated by Mendes for nearly two full rounds due to Chad’s heavy takedown game and positional control. Crazy odds! 7/1 McGregor to win the fight! Unbeatable odds! 7/1 Aldo or 7/1 McGregor to win! Only for Irish punters! 4/1 Conor McGregor to beat Aldo! Enhanced odds - 8/1 Aldo or 5/1 McGregor to win! Price boost: get 5/1 McGregor or 8/1 Aldo to win (risk-free)! 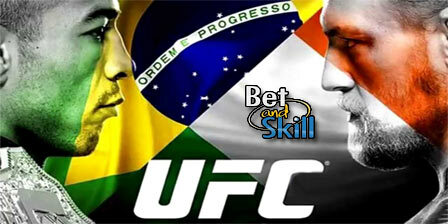 "Jose Aldo v Conor McGregor betting tips, predictions, odds and free bets (UFC 194)"